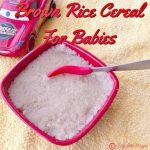 It is yet another very easy recipe which takes about just 10 minutes of your time. 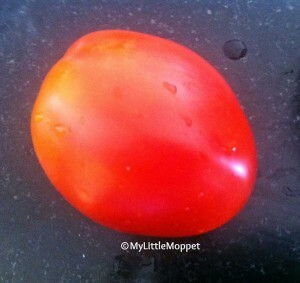 Consult your pediatrician before offering tomato to your baby. Please follow the 3 Day Rule for introducing the tomato juice. Sterilize all the vessels used for making baby food. 1. 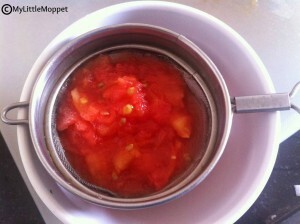 A medium sized tomato yield about 2 tablespoons of juice. 2. 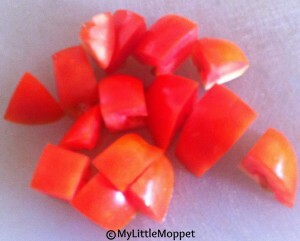 Wash and chop the tomatoes into medium sized pieces. 3. 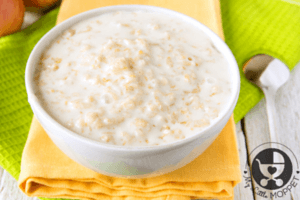 In a bowl, take a half cup of water and allow it to boil. 4. When the water starts boiling switch off the gas and adds the chopped tomatoes to it. 5. Leave it aside for 15 minutes. 6. 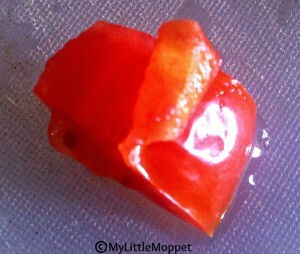 The skin would have peeled after soaking in hot water, gently peel the skin of all the pieces. 7. Mash the contents with a masher or a thick spoon. 9. Tomato juice is ready !!! Please note – Tomato is acidic, so there is a chance of diaper rashes after feeding tomatoes to your little one if it is so, quit tomatoes and do not reintroduce till the baby completes 1 year. 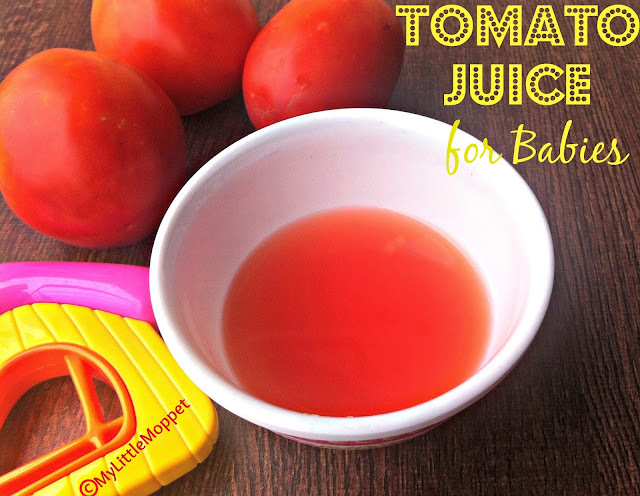 Also, don’t offer more than 2 tablespoons of tomato juice to the baby. Each 100gm of tomato yields about 18 calories. 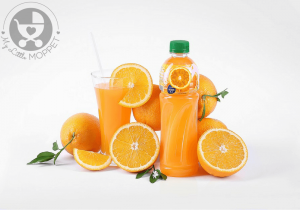 They contain a carotene called Lycopene which is a powerful antioxidant. 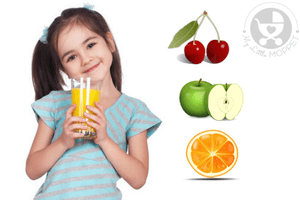 They are a good source of Vitamin A and Vitamin C.
Please be updated with the new posts by following me on Google +, Twitter, Pinterest or liking my Facebook Page My Little Moppet. 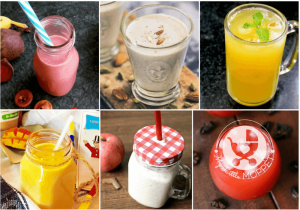 Please click this link for the already posted recipes in Recipe Index. 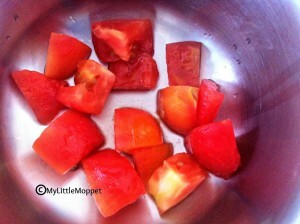 Wash and chop the tomatoes into medium sized pieces. 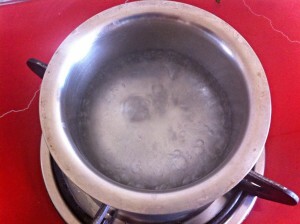 In a bowl, take a half cup of water and allow it to boil. 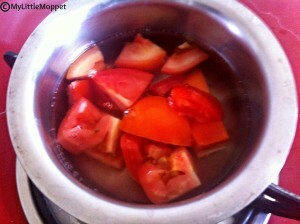 When the water starts boiling switch off the gas and adds the chopped tomatoes to it. Leave it aside for 15 minutes. 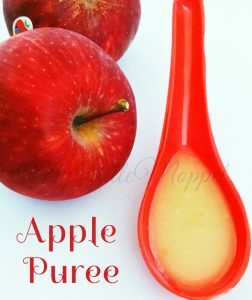 The skin would have peeled after soaking in hot water, gently peel the skin of all the pieces. Mash the contents with a masher or a thick spoon. 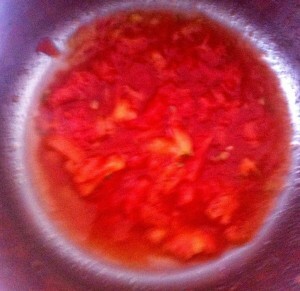 Tomato juice is ready !!! My daughter didnt like the taste of tomato juice. Do you hav any other variation to this reciepe.she is 8months old. You can make tomato soup then.